I love discovering new and unique products for my children. The best are the products that not only look cute, but are also functional and durable. With our summer travels in full swing, I’m glad to have been introduced to a product that both of my boys instantly fell in love with, and that’s not only a functional piece, but also stylish and unique – the GoVinci backpack from BenBat. I received a GoVinci backpack for review in green. The GoVinci backpack is truly a one-of-a-kind product. It’s made of high quality materials that can most definitely stand up to the rough and tumble use from both my boys. 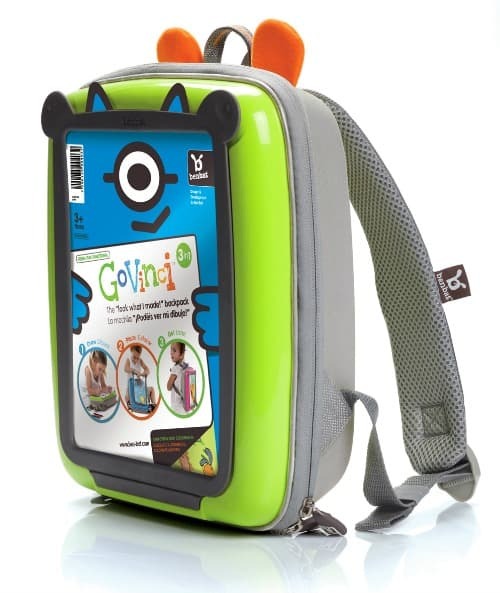 The backpack has a clear outer display frame that opens easily allows your child to showcase their latest drawings, paintings, etc., giving the feel of a having a new backpack with every change. The display also doubles as a solid stop-and-draw work surface. 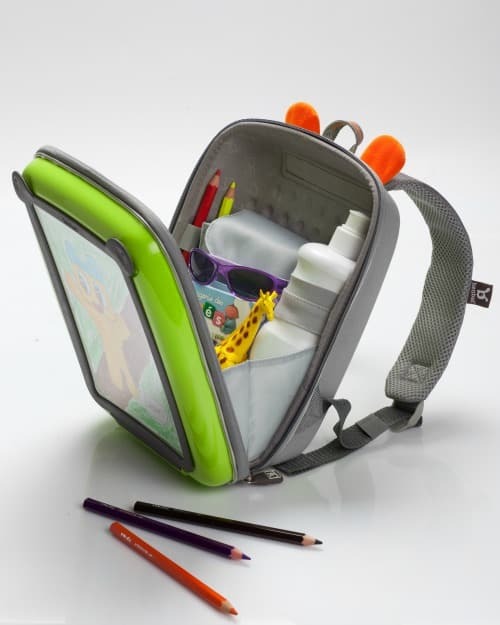 This backpack is great for traveling – it can store all the little treasures my oldest son likes to take along with him on trips and also gives him a nice surface to draw and color on while in the car. I especially like that there are different compartments within the backpack that separate all the little travel essentials for my son – keeping his crayons separate from his books, etc. The shoulder straps are well padded and my son tells me they are very comfy. They also come with safety reflectors for safety. 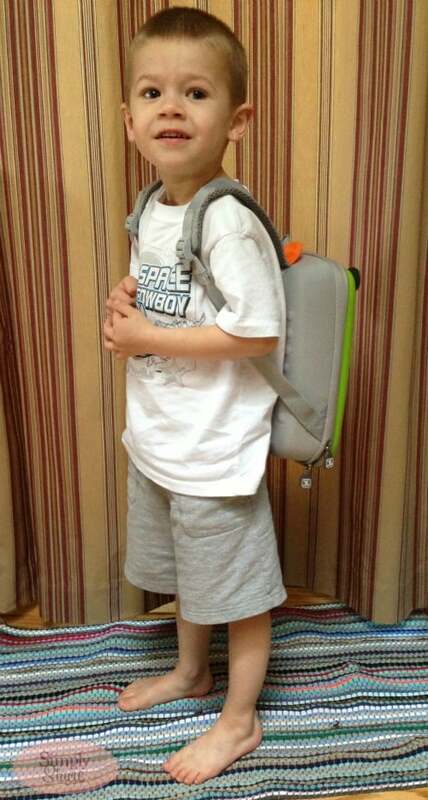 The style of the backpack is unique and fun, and a big hit with both my boys. My youngest was so jealous that I let my older son wear the backpack for the review and he insisted that he get a turn as well! I’m going to have to get one for him too! 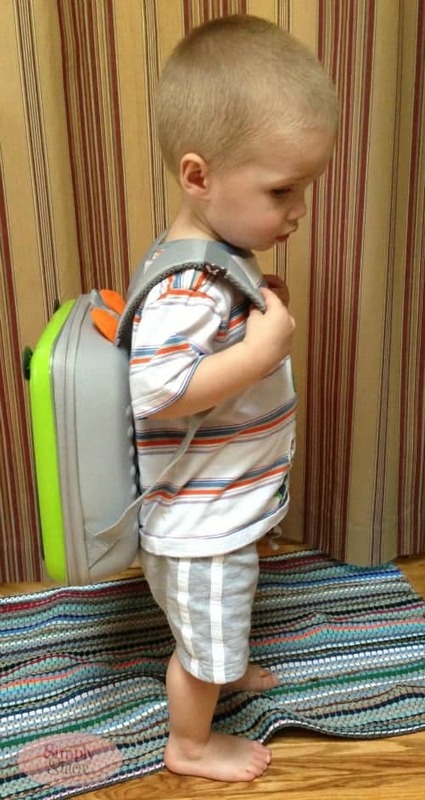 The GoVinci backpack featured in this review sells for $34.99 on the BenBat site and is also available in pink and blue. This product is also available on Amazon.com as well as ToysRUs.com. BenBat is a team of young dynamic team members who create original products that are fun and innovative, and specially designed to brighten the every day activities of infants, toddlers, and children everywhere. BenBat offers a range of products designed for the whole family to enjoy – whether at home, in the car, or in the great outdoors. As a team they ensure that all of their products are clever, safe, attractive, and practical. To see the full line of BenBat products, visit their website. You can also find them on Facebook and YouTube. So cute, not only because you can customize so well. I also love that it is more structured so stuff won’t get smooshed! I love the design of this, wha a great gift for my nephew! this is sooooo cute!! i would totally get one for my son. What a great idea. It looks like it would be helpful in keeping everything organized. What a smart , unique and adorable product! I love that it is multifunctional – perfect for kids on the go! What a great idea! Kids love displaying their work. Our fridge ends up covered with drawings and color pages. How amazing that they can now show off their work everywhere they go. A backpack kids will love and being durable will make it last for lots of art.